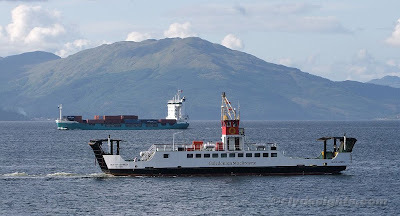 The Tarbert-Portavadie ferry ISLE OF CUMBRAE was seen limping towards her owners' base at Gourock Pier at around half speed, after she developed problems with the drive to her forward propeller unit a few days previously. Her place on the Loch Fyne crossing has been taken by LOCH RIDDON, which in turn has been relieved at Largs by CalMac's spare ferry LOCH BHRUSDA. In the background, the containership VICTORIA was heading from Greenock to Le Havre.